If you're looking for a way to whip the fans into a frenzy at your next football or basketball game, then you might want to consider some long "Hello" cheers to open the game. As your squad hits the floor, you'll want to make a great first impression on the crowd and really connect with fans. By connecting with the fans early on, you will be more easily able to encourage their participation once the game gets going. There are many short and quick hello cheers that can help introduce your team. However, if you have more time to fill or want to make a bigger impression, then long hello cheers may be more suitable for your opening. A longer cheer also gives you time to set a sort of mood and rhythm that can generate excitement in the crowd and encourage them to cheer your team on to victory. Tried and true favorites include chants such as "We are the Eagles, the mighty mighty Eagles" and "Hi, Hello and How Are You?" But, if you are like most squads, you probably want something a little more unique that the crowd hasn't heard before. 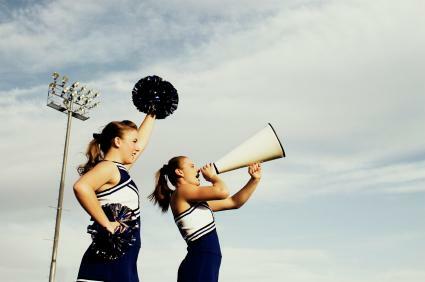 By using unique cheers, your cheerleading team will be set apart from other cheerleaders. You can also customize the hello cheer to match the mood and motto of your team. Here are a few to get you started. Repeat until each cheerleader has taken a turn. As the cheerleaders say the words "step forward" the new cheerleader that is about to introduce herself will step forward. As the squad says "step back" the cheerleader who just introduced herself will fall back in line. Although this cheer is created for a team called the "Warriors", you can easily substitute any mascot name.Hey there! Hey there! Hey! Hi-ya! How do you do? Introduce each cheerleader with a roll call type cheer and end by repeating the cheer above a second time. By going through each cheerleader's name and telling a little about that cheerleader through a cheer chant, this cheer is going to become a fairly long hello cheer. There may be occasions when there is not enough time to do a hello cheer that is longer. However, when time constraints are not a consideration, a longer hello cheer can help to set the mood for the fans. Fans enjoy getting to know their cheerleaders. The better they know you and understand your desire to cheer your team on to victory, the more likely they'll be to cheer along with you when you need their help and enthusiasm during the game.